The leveling indicator often suggests that the resource be leveled on a Day By Day basis because Microsoft Project has found that this resource is overallocated by at least one minute over the resource availability for a day. You might find that level of detail too fine for your purposes. It might be more effective to level resources on a Week By Week basis or a Month By Month basis. Although the overal-location is still detected when you're overallocated by just one minute, looking at the entire week or the entire month instead of just one day provides more "wiggle room" for overallocations to take care of themselves. To change the leveling trigger, click Tools, Level Resources. In the Look For Overallocations On A Basis box, click Week By Week or Month By Month. Click OK.
1 Click View, Resource Usage (see Figure 11-18). Figure 11-18. The Resource Usage view shows how resources are allocated for each time period, as well as the specific assignments that contribute to that allocation. Any resource whose name appears in red or with a leveling indicator is overallocated. 2 Review the timesheet portion of the view to see where the overallocation occurs. You might need to scroll to move to a different time period. 3 On the Standard toolbar, click the Zoom Out button to see the Resource Usage view for a longer period of time. Click the Zoom In button to see details about a shorter period of time. 4 Review the sheet portion of the view to see the assignments for each resource. 5 You can add the Overallocation field to the timesheet portion of the view, which you can use to learn how many hours or days, for example, a resource is overallocated. To do this, click Format, Details, Overallocation (see Figure 11-19). Figure 11-19. Add the Overallocation field to the Resource Usage view to see the number of hours (or other time period) by which each resource is overallocated. 6 To see underallocations or the amount of time that a resource is available for more assignments, add the Remaining Availability field to the timesheet portion of the view. Click Format, Details, Remaining Availability. 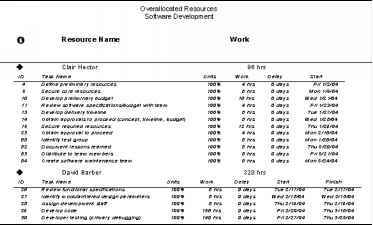 If you apply the Work table to the Resource Usage view, you can see work details and tracking information for each resource and assignment—including baseline work, the variance between the baseline and scheduled work, any actual work reported, remaining work, and percent complete. dialog box, click Resource Allocation and then click Apply (see Figure 11-20). Figure 11-20. With the Resource Allocation view, you can see task information in the lower pane for any assignment you click in the Resource Usage view in the upper pane. With the Summary table applied to a resource view, you can see the Peak field, which can quickly tell you whether resources are allocated to their maximum availability (100 percent), overallocated (more than 100 percent), or underallocated (less than 100 percent). 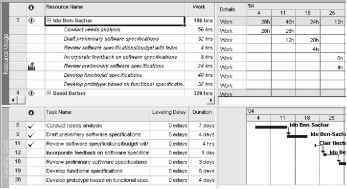 Click View, Table, Summary (see Figure 11-21). Figure 11-21. By reviewing the Peak field for resources, you can quickly see how many resources are allocated and whether they're available to take on more assignments. Figure 11-22. Apply the Overallocated Resources filter to a resource view to quickly see a list of resources who have more work assigned than time available for that work. With a resource view displayed, apply a filter by clicking the Filter tool on the Formatting toolbar. In the Filter list, click the name of the filter you want. Figure 11-23. Run the Overallocated Resources report to get detailed information about resources who have too much work assigned. To run an assignments or workload report, click View, Reports. Double-click Assignments or Workload and then double-click the report you want. Or perhaps your company had a reduction in force, and your project staffing was reduced by 15 percent. • Adjust assignments, for example, add resources, replace resources, delay a task or assignment, or specify overtime. • Split tasks to balance the workload. 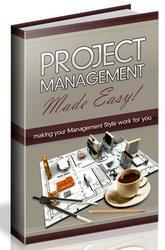 • Use the Microsoft Project leveling feature to balance the workload. • Adjust scope (this will probably require stakeholder approval). For more information about using any of these strategies to better allocate your resources, see "Balancing Resource Workloads" on page 271. Note When you adjust your project plan to achieve the resource allocation levels you need, be sure to check the scheduled finish date, costs, and scope. 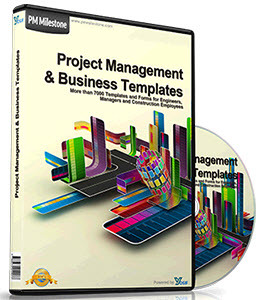 You need to know how your changes affect other areas of the project plan.